Signed by cover artist Art Adams with Lone Star Comics certificate of authenticity. 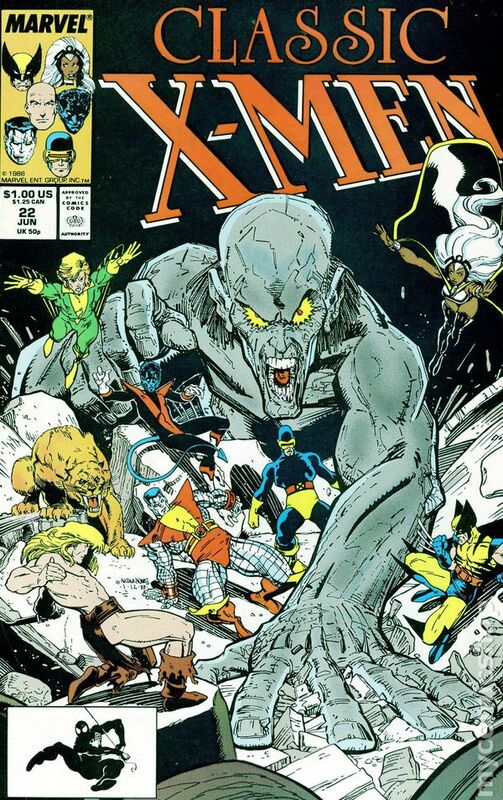 This issue integrates 20 new pages into a reprint of Giant-Size X-Men 1. "First Night." Script by Chris Claremont, new art by John Bolton, reprint art by Dave Cockrum. New Arthur Adams front cover; new John Bolton back cover. Cover price $1.00. 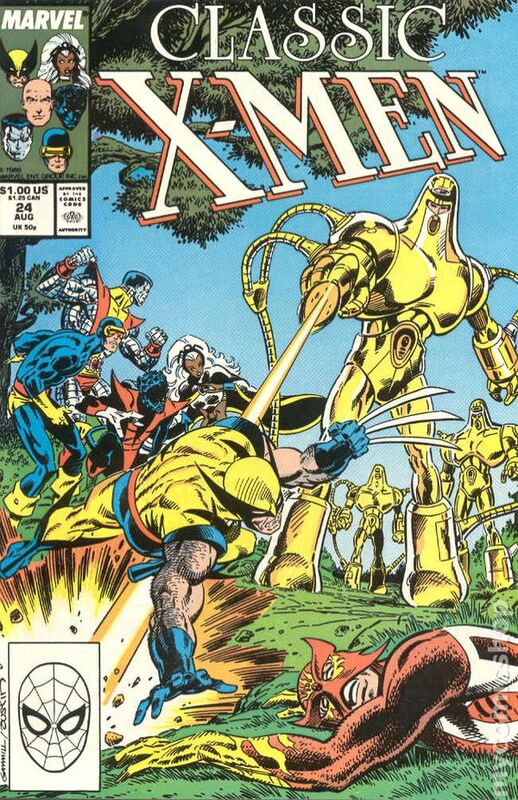 This issue integrates 5 new pages into a reprint of Uncanny X-Men 94. "The Doomsmith Scenario!" Script by Chris Claremont, new and reprint art by Dave Cockrum. New Storm/Jean Grey back-up story: "First Friends." Script by Claremont, art by John Bolton. Moon Knight appearance. New Arthur Adams front cover; new John Bolton back cover. Cover price $1.00. 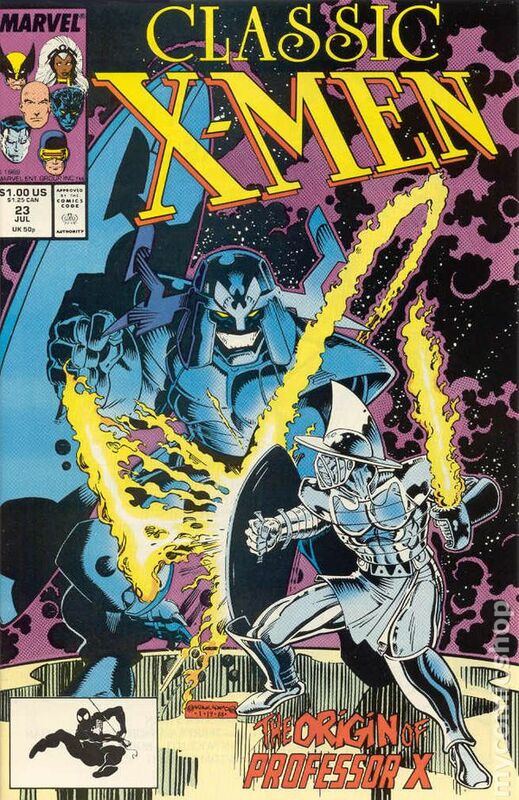 This issue integrates about 2 new pages into a reprint of Uncanny X-Men 95. "Warhunt!" Script by Chris Claremont, new and reprint art by Dave Cockrum. New back-up story: "Mourning." Script by Claremont, art by John Bolton. Moon Knight appearance. New Arthur Adams front cover (frame art by John Romita Sr./Al Williamson); new John Bolton back cover. Cover price $1.00. This issue integrates 2 new pages into a reprint of Uncanny X-Men 96. "Night of the Demon!" Script by Chris Claremont, new and reprint pencils by Dave Cockrum, new inks by Jack Abel, reprint inks by Sam Grainger. New back-up story: "The Big Dare." Script by Claremont, art by John Bolton. Moon Knight appearance. New Arthur Adams/Craig Russell illustration and front cover; new John Bolton back cover. Cover price $1.00. 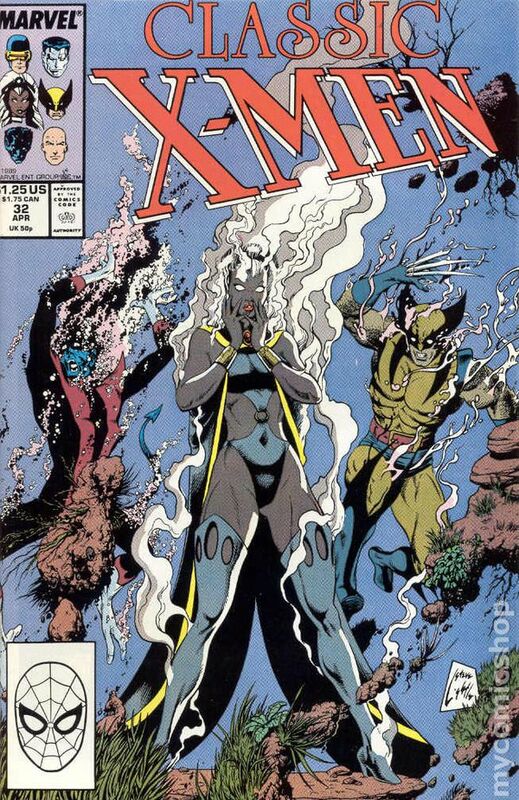 This issue integrates 2 new pages into a reprint of Uncanny X-Men 97. "My Brother, My Enemy!" Script by Chris Claremont, new and reprint pencils by Dave Cockrum, inks by Sam Grainger. New Colossus back-up story: "Prison of the Heart." Script by Claremont, art by John Bolton. New Arthur Adams/Craig Russell illustration and front cover; new John Bolton back cover. Cover price $1.00. This issue integrates 3 new pages into a reprint of Uncanny X-Men 98. "Merry Christmas, X-Men--The Sentinels Have Returned!" Script by Chris Claremont, new pencils by James Fry, reprint pencils by Dave Cockrum, new inks by Jack Abel and Mike Esposito, reprint inks by Sam Grainger. New Cyclops back-up story: "A Love Story." Script by Claremont, art by John Bolton. New Arthur Adams/Craig Russell illustration and front cover; new John Bolton back cover. Cover price $1.00. 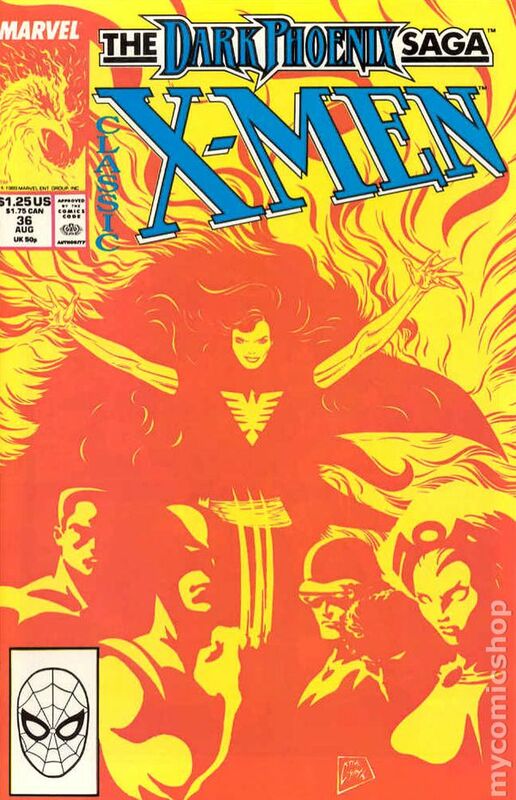 This issue integrates 3 new pages into a reprint of Uncanny X-Men 99. "Deathstar, Rising!" Script by Chris Claremont, new pencils by Jim Sherman, reprint pencils by Dave Cockrum, new inks by Joe Rubinstein, reprint inks by Sam Grainger. New back-up story: "Out With the Old." Script by Claremont, art by John Bolton. New Arthur Adams/Craig Russell illustration and front cover; new John Bolton back cover. Cover price $1.00. This issue integrates 2 new pages into a reprint of Uncanny X-Men 100. "Greater Love Hath No X-Men!" Script by Chris Claremont, new pencils by Jim Sherman, new inks by Sam Grainger, reprint pencils and inks by Dave Cockrum. New Phoenix untitled back-up story. Script by Claremont, art by John Bolton. X-Men pin-up by Cockrum. New Arthur Adams illustration and front cover; new John Bolton back cover. Cover price $1.00. This issue integrates 3 new pages into a reprint of Uncanny X-Men 101. "Like a Phoenix From the Ashes!" Script by Chris Claremont, new pencils by Tom Morgan, reprint pencils by Dave Cockrum, new inks by Sam Grainger, reprint inks by Frank Chiaramonte. New Nightcrawler back-up story: "The Gift." Script by Claremont, art by John Bolton. New Arthur Adams illustration and front cover; new John Bolton back cover. Cover price $1.00. 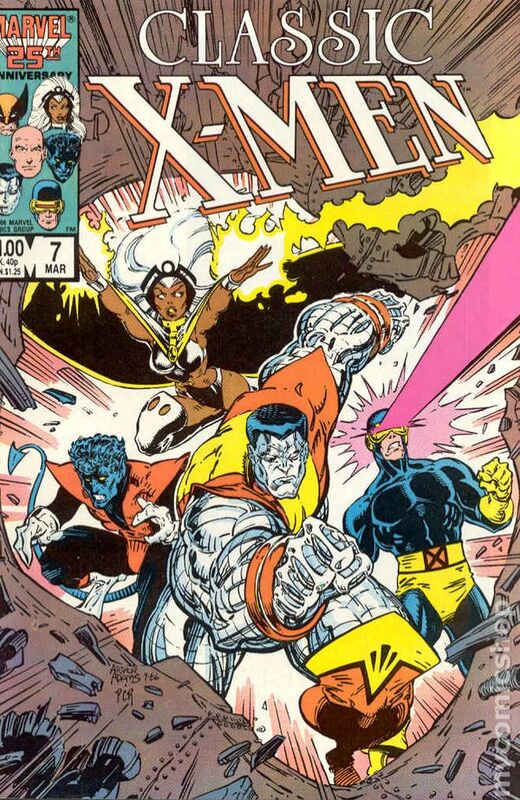 This issue integrates about 3 new pages into a reprint of Uncanny X-Men 102. "Who Will Stop the Juggernaut?" Script by Chris Claremont, new pencils by John Romita, reprint pencils by Dave Cockrum, new and reprint inks by Sam Grainger. New Wolverine back-up story: "Tag, Sucker." Script by Claremont, art by John Bolton. New Arthur Adams illustration; new Adams/Terry Austin front cover; new John Bolton back cover. Cover price $1.00. This issue integrates about 2 new pages into a reprint of Uncanny X-Men 103. "The Fall of the Tower!" Script by Chris Claremont, pencils by Dave Cockrum, inks by Sam Grainger. New Storm back-up story: "Hope." Script by Claremont, art by John Bolton. New Mike Mignola illustration; new Bob Layton front cover; new John Bolton back cover. Cover price $1.00. This issue integrates 3 new pages into a reprint of Uncanny X-Men 104. "The Gentleman's Name is Magneto!" Script by Chris Claremont, pencils by Dave Cockrum, inks by Sam Grainger. 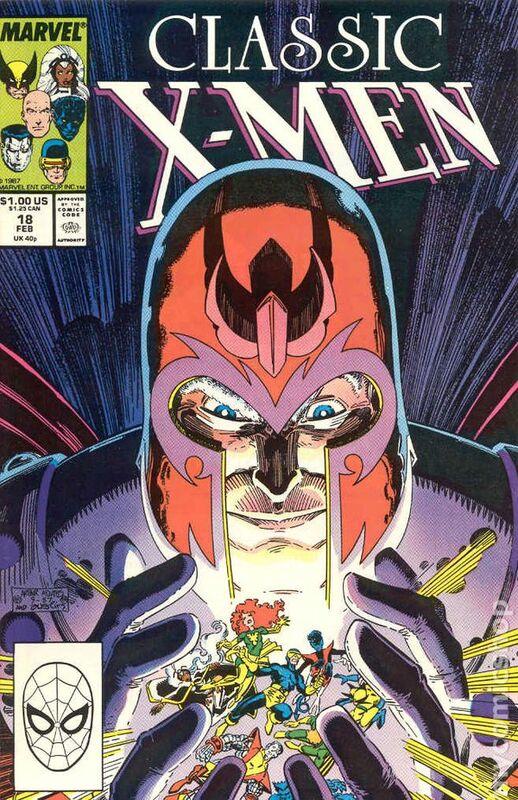 New Magneto back-up story: "A Fire in the Night." Script by Claremont, art by John Bolton. Part Magneto origin. New Arthur Adams illustration; new Adams/Al Williamson front cover; new John Bolton back cover. Cover price $1.00. 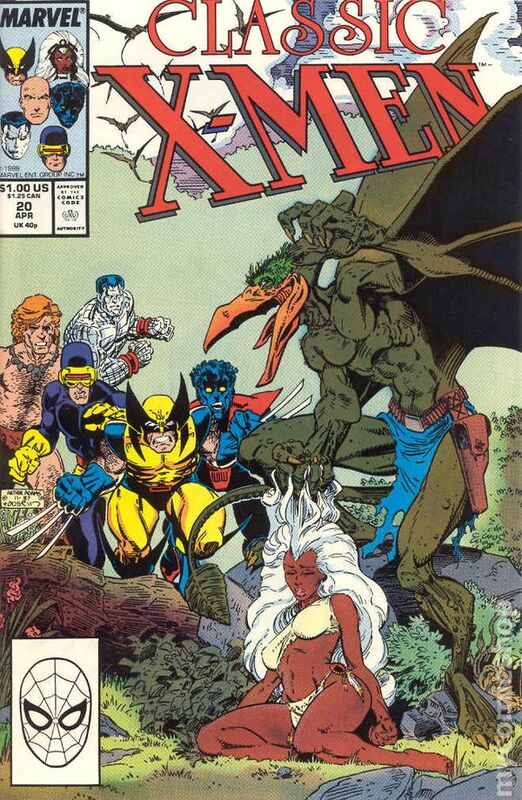 This issue integrates about 3 new pages into a reprint of Uncanny X-Men 105. "Phoenix Unleashed!" Script by Chris Claremont, new pencils by Bob Layton, reprint pencils by Dave Cockrum, inks by Layton. New Phoenix back-up story: "Lifesigns." Script by Claremont, art by John Bolton. Appearances by Dan Rand (Iron Fist), Misty Knight, and Colleen Wing. New Arthur Adams/Al Williamson illustration and front cover; new Bolton back cover. Cover price $1.00. This issue integrates 3 new pages into a reprint of Uncanny X-Men 107. "Where No X-Man Has Gone Before!" Script by Chris Claremont, new pencils by Chuck Patton, reprint pencils by Dave Cockrum, inks by Dan Green. New Princess Lilandra back-up story: "What Stuff Our Dreams Are Made Of." Script by Claremont, art by John Bolton. New Arthur Adams/Al Williamson illustration and front cover; new Bolton back cover. Cover price $1.00. 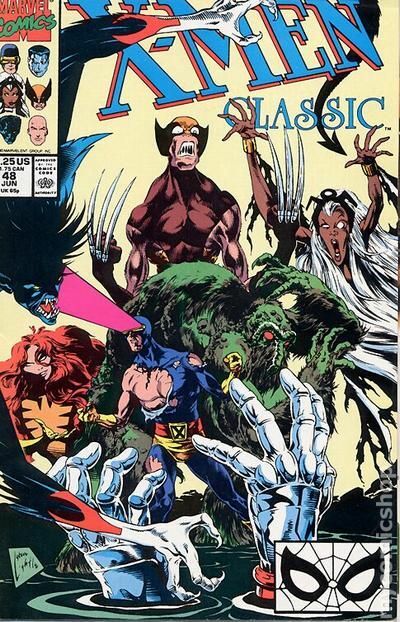 This issue integrates about 3 new pages into a reprint of Uncanny X-Men 108. "Armageddon Now!" Script by Chris Claremont, new pencils by Chuck Patton, reprint pencils by John Byrne, inks by Terry Austin. New back-up story: "Starjammers Aloft." Script by Claremont, art by John Bolton. New Arthur Adams/Austin illustration and front cover; new Bolton back cover. Cover price $1.00. 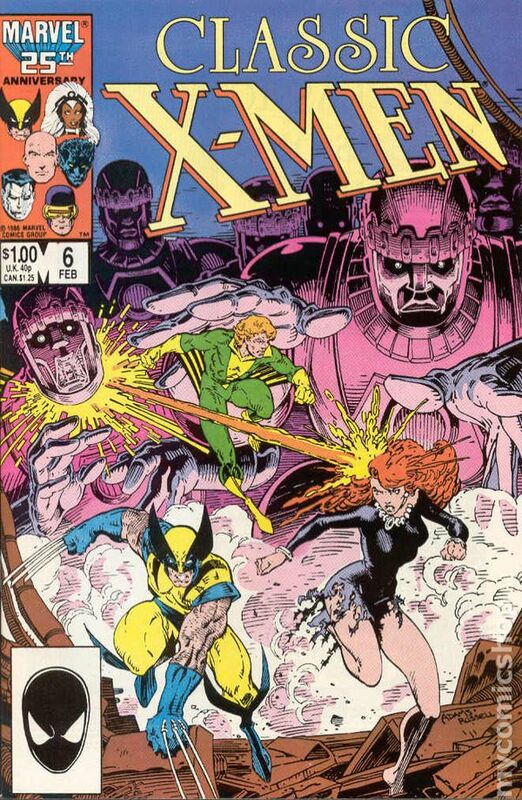 This issue integrates about 3 new pages into a reprint of Uncanny X-Men 109. "Home Are the Heroes!" Script by Chris Claremont, new pencils by Kieron Dwyer, reprint pencils by John Byrne, inks by Terry Austin. New Banshee back-up story: "Dearest Friend." Script by Claremont, art by John Bolton. New Arthur Adams/Austin illustration and front cover; new Bolton back cover. Cover price $1.00. This issue integrates 2 new pages into a reprint of Uncanny X-Men 111. "Mindgames!" Script by Chris Claremont, new pencils by Kieron Dwyer, reprint pencils by John Byrne, inks by Terry Austin. New back-up story: "A Taste for Vengeance." Script by Claremont, art by John Bolton. New Jon Bogdanove/Austin illustration and front cover; new Bolton back cover. Cover price $1.00. 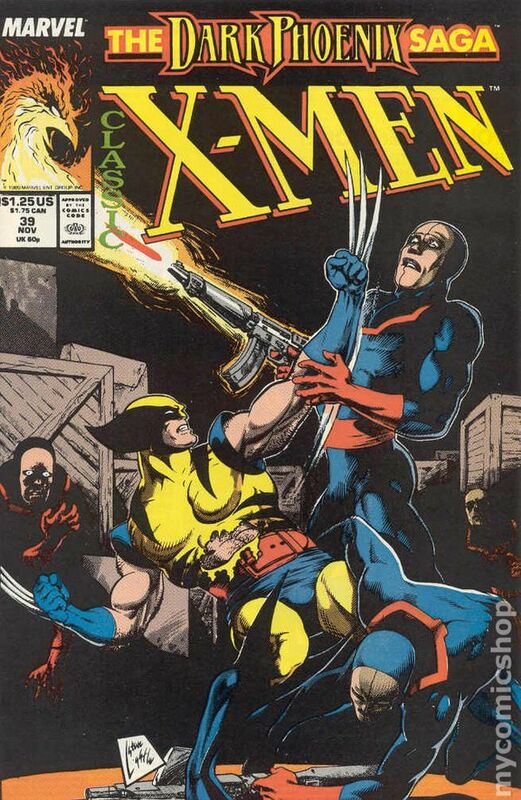 This issue integrates 3 new pages into a reprint of Uncanny X-Men 112. "Magneto Triumphant!" Script by Chris Claremont, new pencils by Kieron Dwyer, reprint pencils by John Byrne, inks by Terry Austin. New back-up story: "Stalking Life." Script by Mary Jo Duffy, art by John Bolton. New Arthur Adams/Austin illustration and front cover; new Bolton back cover. Cover price $1.00. This issue integrates 3 new pages into a reprint of Uncanny X-Men 113. "Showdown!" Script by Chris Claremont, new pencils by Kieron Dwyer, reprint pencils by John Byrne, inks by Terry Austin. New Magneto back-up story: "I, Magneto." Script by Claremont, art by John Bolton. New Arthur Adams/Austin illustration and front cover; new Bolton back cover. Cover price $1.00. This issue integrates 4 new pages into a reprint of Uncanny X-Men 114. "Desolation!" Script by Chris Claremont, new pencils by Kieron Dwyer, reprint pencils by John Byrne, inks by Terry Austin. New Stoem back-up story: "Mother of the Bride." Script by Mary Jo Duffy, art by John Bolton. New Arthur Adams/Austin illustration and front cover; new Bolton back cover. Cover price $1.00. 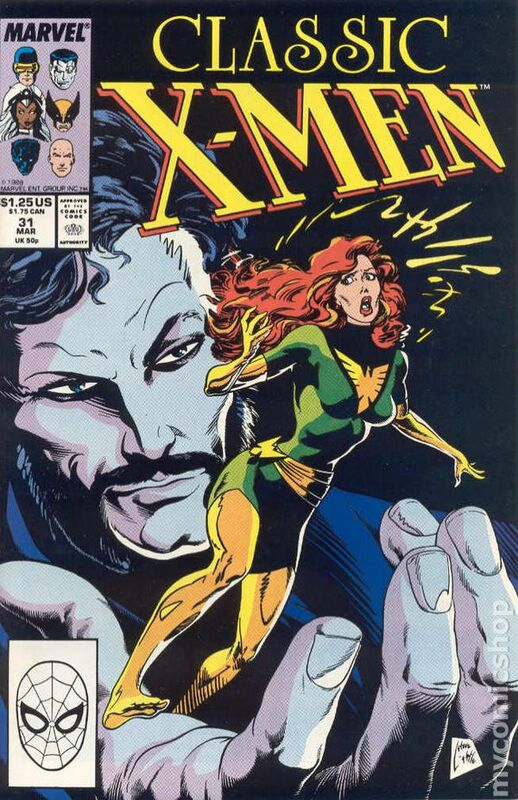 Signed by writer Chris Claremont with Lone Star Comics certificate of authenticity. This issue integrates 3 new pages into a reprint of Uncanny X-Men 115. "Visions of Death!" Script by Chris Claremont, new pencils by Kieron Dwyer, reprint pencils by John Byrne, inks by Terry Austin. New Colossus back-up story: "First Love." Script by Claremont, art by John Bolton. New Arthur Adams/Austin illustration and front cover; new Bolton back cover. Cover price $1.00. New John Bolton art, plus John Byrne reprint of Uncanny X-Men 116. 1 page Arthur Adams art; new Adams cover. Cover price $1.00. 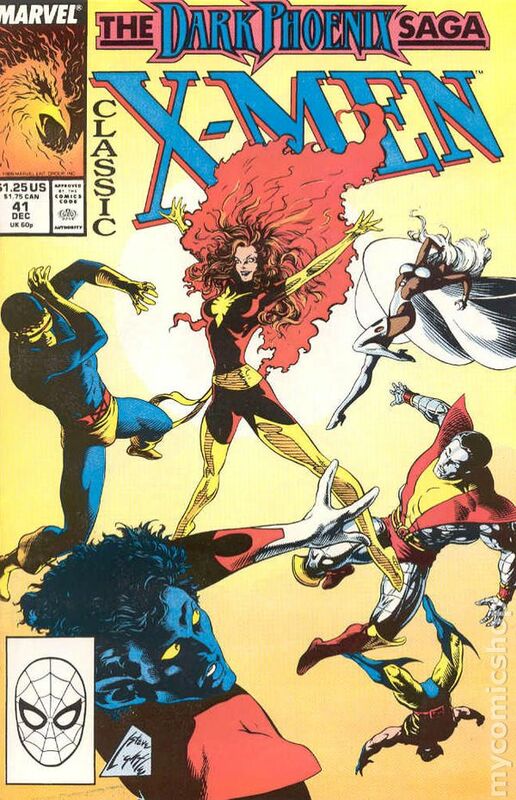 This issue integrates new pages into a reprint of Uncanny X-Men 117. "Psi-War!" Script by Chris Claremont, new pencils by Kieron Dwyer, reprint pencils by John Byrne, inks by Terry Austin. New Nightcrawler back-up story: "Nightcrawler's High Adventure." Script by Claremont, art by John Bolton. Arthur Adams pin-up (reprint); Mark Chiarello/Kent Williams pin-up (new?). New Adams illustration and front cover; new Bolton back cover. Cover price $1.00. 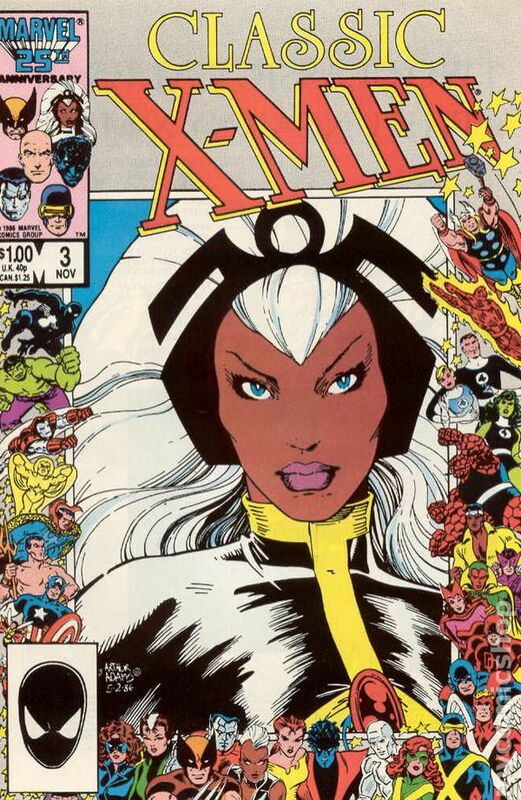 This issue integrates new pages into a reprint of Uncanny X-Men 118. "The Submergence of Japan." Script by Chris Claremont, new art by Kieron Dwyer/Terry Austin, reprint art by John Byrne/Ricardo Villamonte. New Phoenix back-up story: "Vacation." Script by Claremont, art by John Bolton. Unused X-Men covers by Byrne/Austin and Paul Smith. New Kerry Gammill/Austin illustration and front cover; new Bolton back cover. Cover price $1.00. 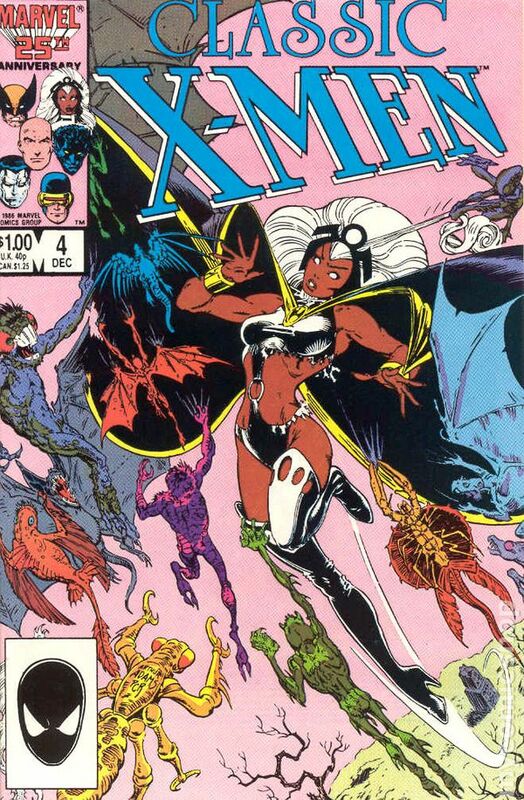 This issue integrates new pages into a reprint of Uncanny X-Men 119. "'Twas the Night Before Christmas." Script by Chris Claremont, new pencils by Kieron Dwyer, reprint pencils by John Byrne, inks by Terry Austin. New Wolverine back-up story: "Just Don't Look in its Eyes." Script by Ann Nocenti, art by John Bolton. New Kerry Gammill/Austin illustration and front cover; new Bolton back cover. Cover price $1.00. 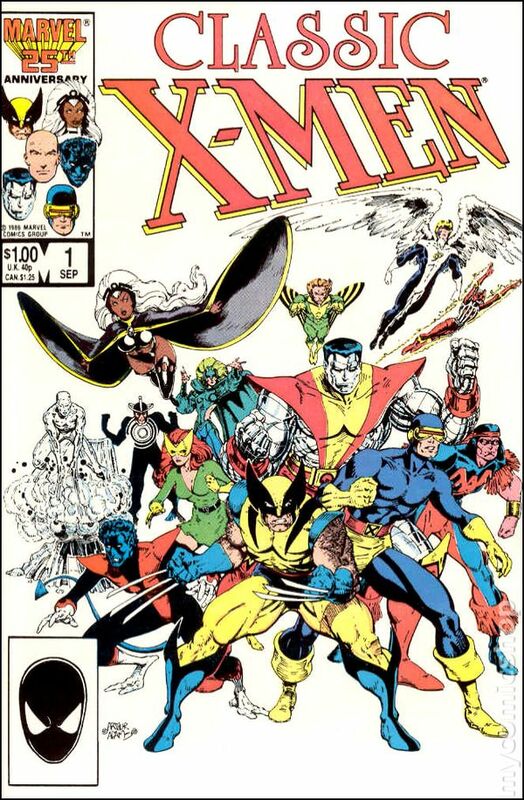 This issue integrates new pages into a reprint of Uncanny X-Men 120. "Wanted: Wolverine! Dead or Alive!" Script by Chris Claremont, new pencils by Kieron Dwyer, reprint pencils by John Byrne, inks by Terry Austin. New Wolverine back-up story: "So Much in Common!" Script by Tom Orzechowski, art by John Bolton. New Kerry Gammill/Austin illustration and front cover; new Bolton back cover. Cover price $1.00. 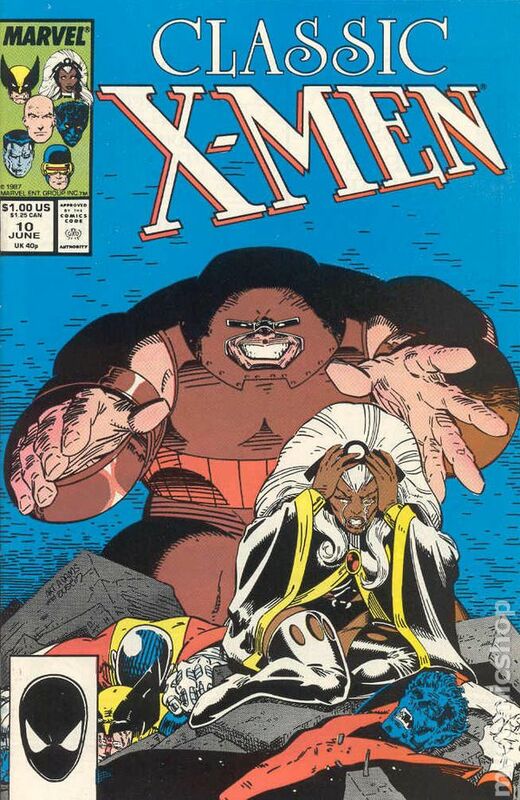 This issue integrates new pages into a reprint of Uncanny X-Men 121. "Shoot-Out at the Stampede!" Script by Chris Claremont, new pencils by Kieron Dwyer, reprint pencils by John Byrne, inks by Terry Austin. New Wolverine/Phoenix back-up story: "Backlash." 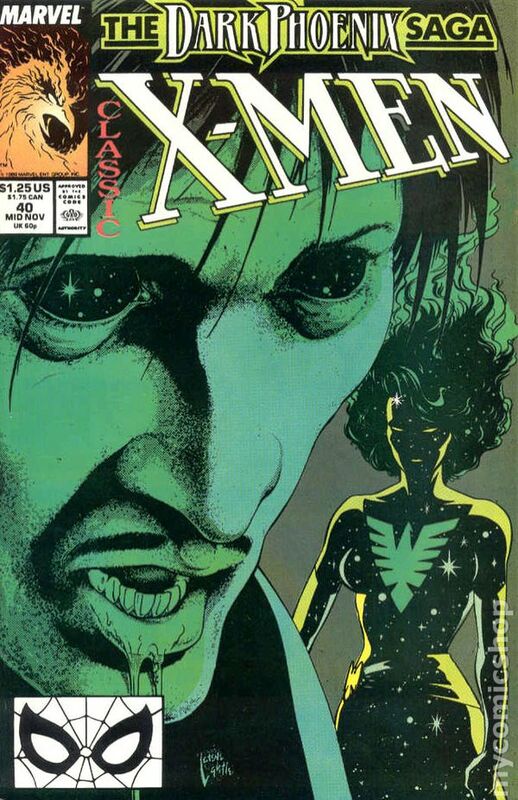 Script by Ann Nocenti, art by John Bolton. New Dwyer/Austin illustration and front cover; new Bolton back cover. Cover price $1.25. 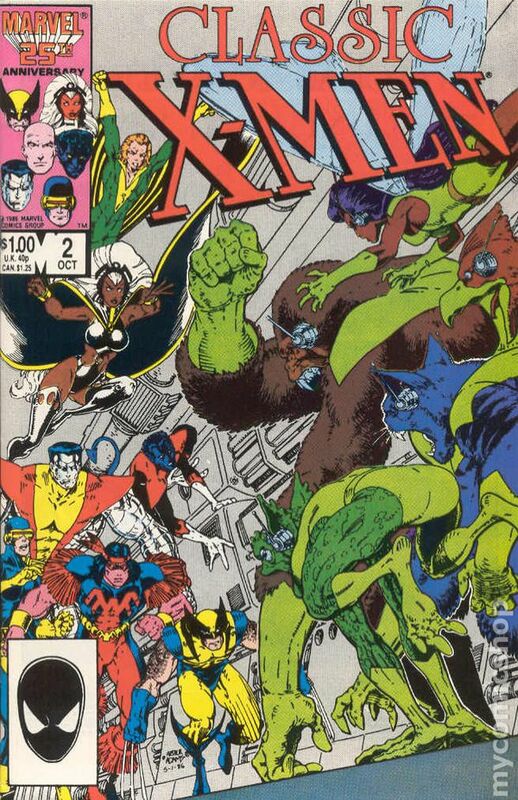 This issue reprints Uncanny X-Men 122. "Cry for the Children!" 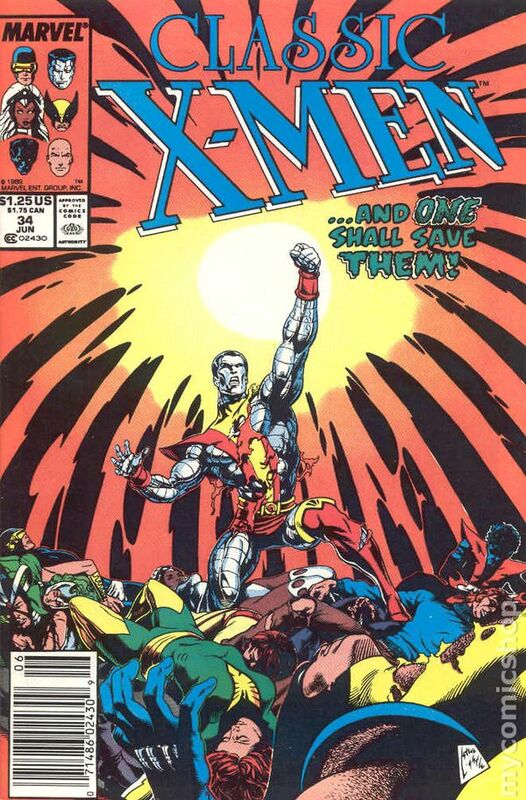 Script by Chris Claremont, pencils by John Byrne, inks by Terry Austin. New back-up story: "Who Am I?" Script by Ann Nocenti, art by John Bolton. Pin-up by Marc Silvestri/Dan Green. New Kieron Dwyer/Austin illustration and front cover; new Bolton back cover. Cover price $1.25. 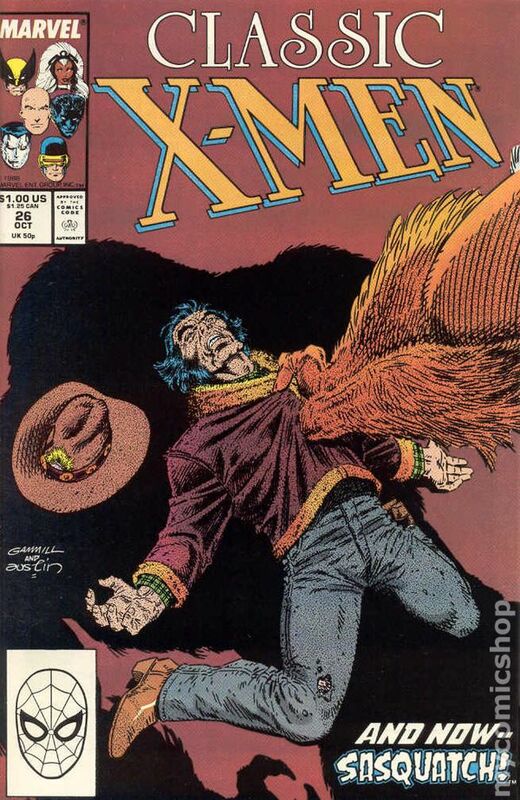 This issue reprints Uncanny X-Men 123. "Listen--Stop Me If You've Heard It--But This One Will Kill You!" Script by Chris Claremont, pencils by John Byrne, inks by Terry Austin. New Colossus back-up story: "Motherland." Script by Ann Nocenti, pencils by June Brigman, inks by Roy Richardson. New Kieron Dwyer/Milgrom illustration and front cover; new Bolton back cover. Cover price $1.25. 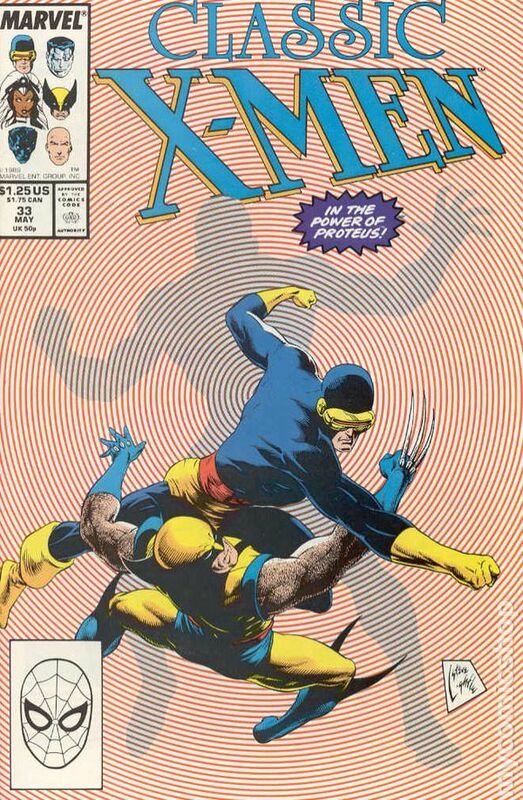 This issue reprints Uncanny X-Men 124. "He Only Laughs When I Hurt!" 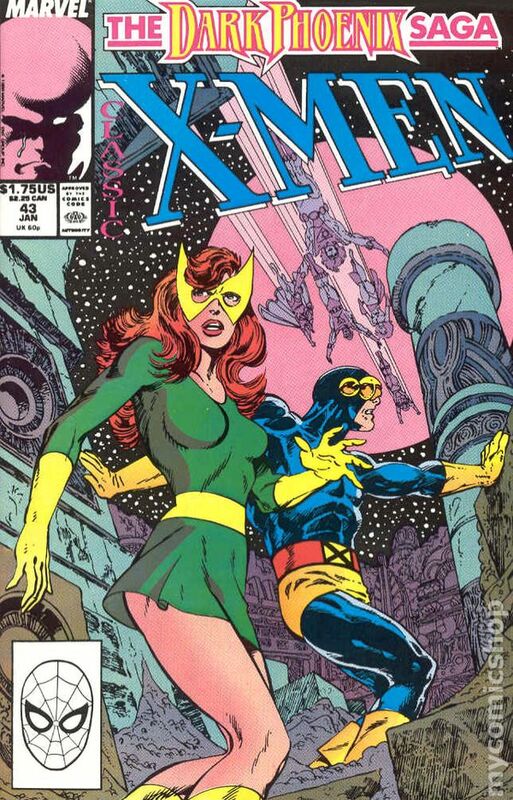 Script by Chris Claremont, pencils by John Byrne, inks by Terry Austin. New Arcade back-up story: "Play With Me." Script by Ann Nocenti, art by John Bolton. New Steve Lightle illustration and front cover; new Bolton back cover. Cover price $1.25. 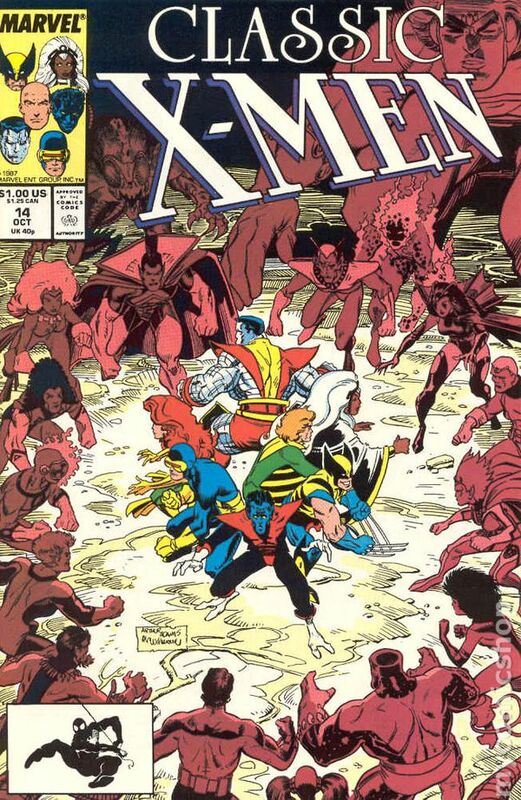 This issue reprints Uncanny X-Men 125. "There's Something Awful on Muir Island!" 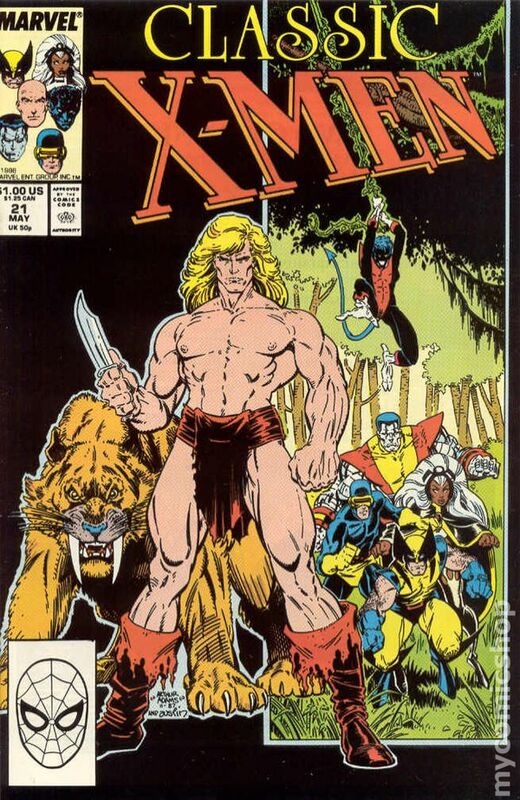 Script by Chris Claremont, pencils by John Byrne, inks by Terry Austin. New Professor X back-up story: "Spigot at the End of the Universe." Script by Ann Nocenti, art by John Bolton. New Steve Lightle illustration and front cover; new Bolton back cover. Cover price $1.25. 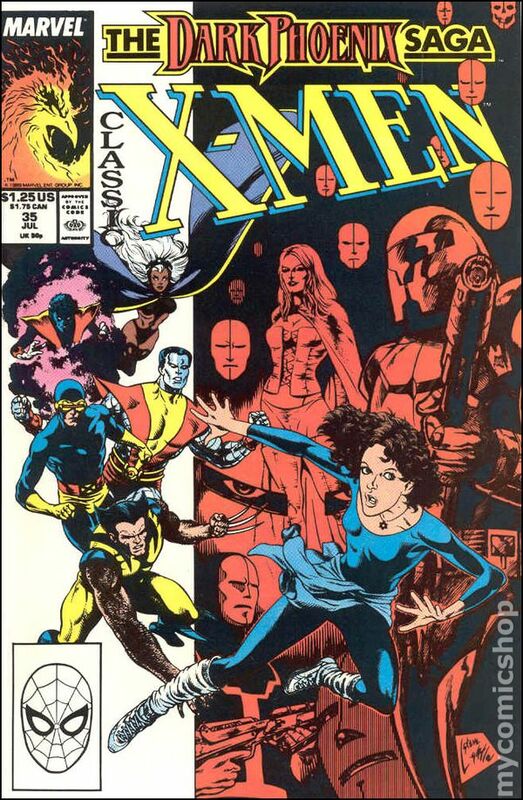 This issue reprints Uncanny X-Men 126. "How Sharper Than a Serpent's Tooth!" Script by Chris Claremont, pencils by John Byrne, inks by Terry Austin. New Wolverine/Nightcrawler back-up story: "Shreds of Humanity." Script by Ann Nocenti, art by John Bolton. New Steve Lightle illustration and front cover; new Bolton back cover. Cover price $1.25. 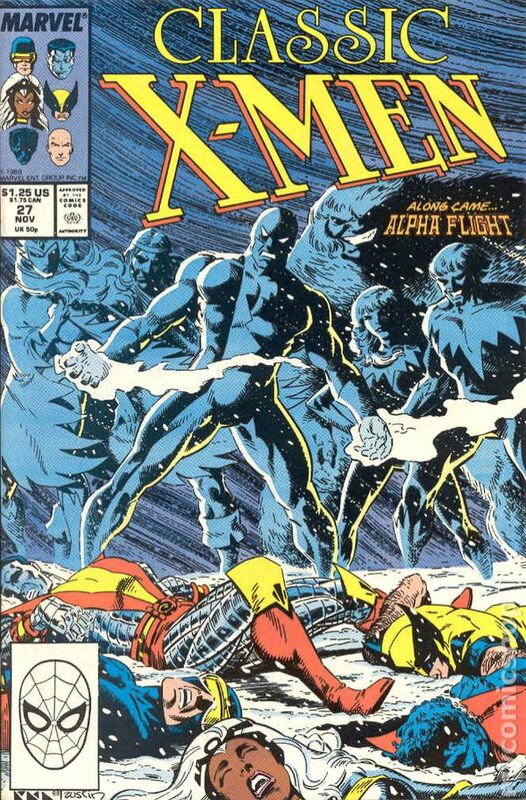 This issue reprints Uncanny X-Men 127. "The Quality of Hatred!" Script by Chris Claremont, pencils by John Byrne, inks by Terry Austin. New Havok/Polaris back-up story: "So Good It Hurts." Script by Ann Nocenti, art by John Bolton. New Steve Lightle illustration and front cover; new Bolton back cover. Cover price $1.25. 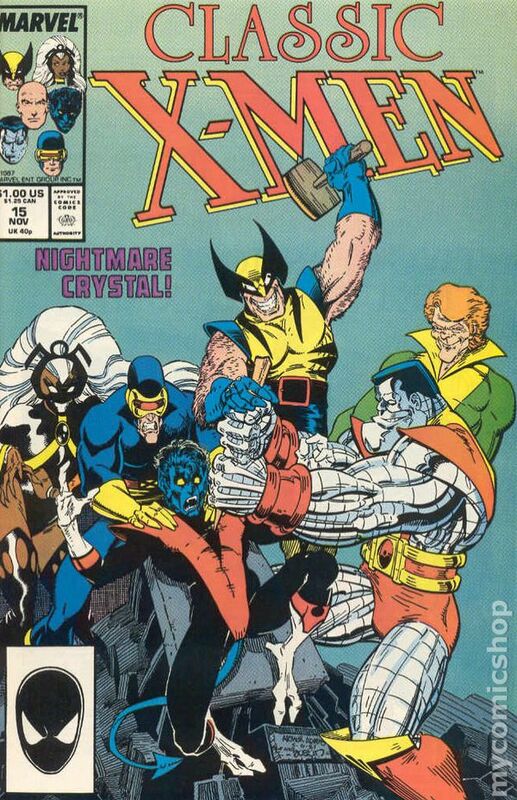 This issue reprints Uncanny X-Men 128. "The Action of the Tiger!" Script by Chris Claremont, pencils by John Byrne, inks by Terry Austin. New Jason Wyngarde/White Queen back-up story: "Double Negative." Script by Ann Nocenti, art by John Bolton. New Steve Lightle illustration and front cover; new Bolton back cover. Cover price $1.25. 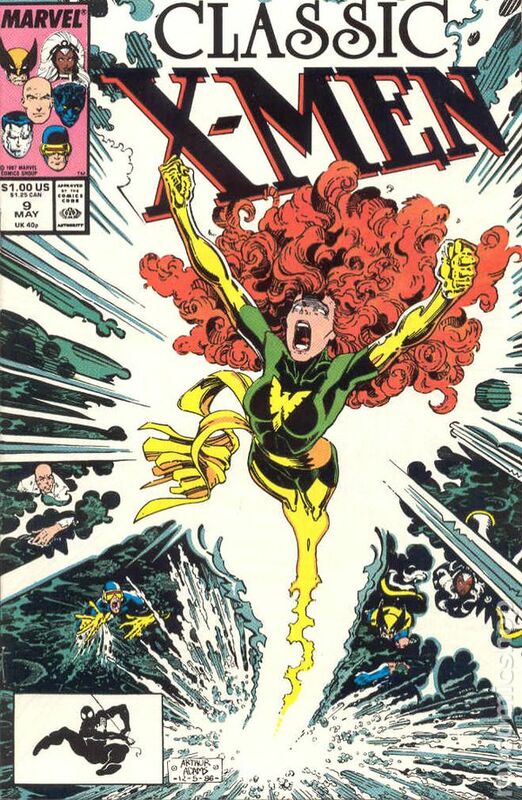 This issue reprints the first appearance of Kitty Pryde in Uncanny X-Men 129. "God Spare the Child." 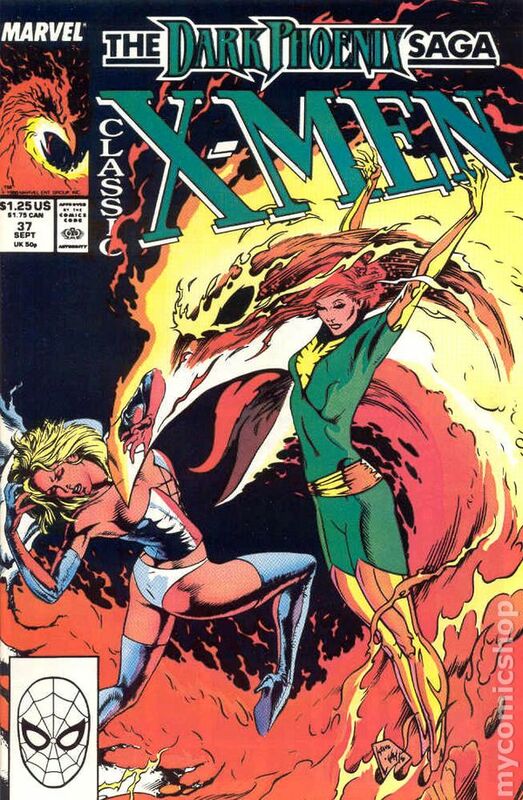 Script by Chris Claremont, pencils by John Byrne, inks by Terry Austin. New Kitty Pryde back-up story: "Paper, Not Paper." Script by Daryl Edelman, art by John Bolton (his last work for the series). New Steve Lightle illustration and front cover; new Bolton back cover. Cover price $1.25. 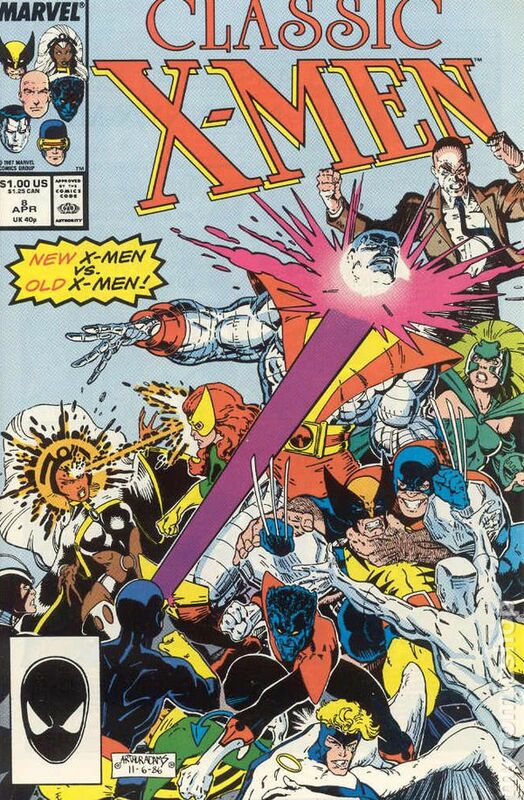 This issue reprints Uncanny X-Men 130. "Dazzler." Script by Chris Claremont, pencils by John Byrne, inks by Terry Austin. New Banshee back-up story: "Outside In." Script by Ann Nocenti, pencils by Mark Bright, inks by Joe Rubinstein. New Steve Lightle illustration and front cover; new Bright/Rubinstein back cover. Cover price $1.25. 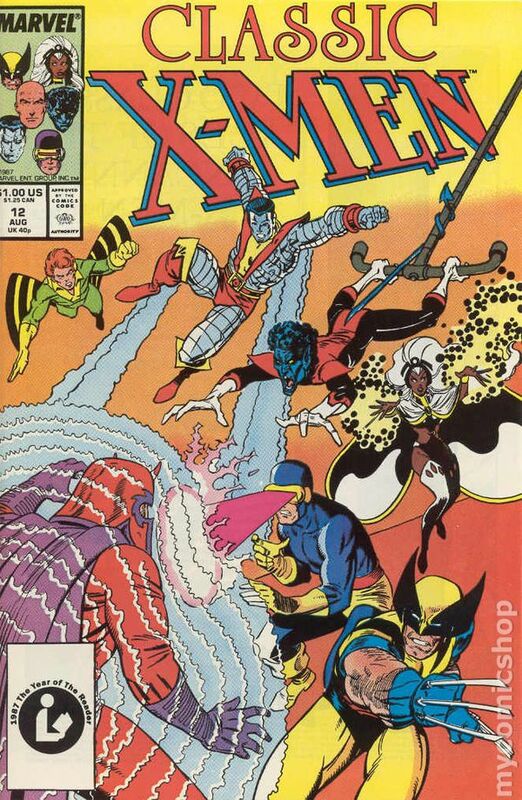 This issue reprints Uncanny X-Men 131. "Run For Your Life!" Script by Chris Claremont, pencils by John Byrne, inks by Terry Austin. New Dazzler back-up story: "Was Not What Will Be." Script by Fabian Nicieza, pencils by Rick Leonardi, inks by Bob McLeod. New Steve Lightle illustration and cover. Cover price $1.25. 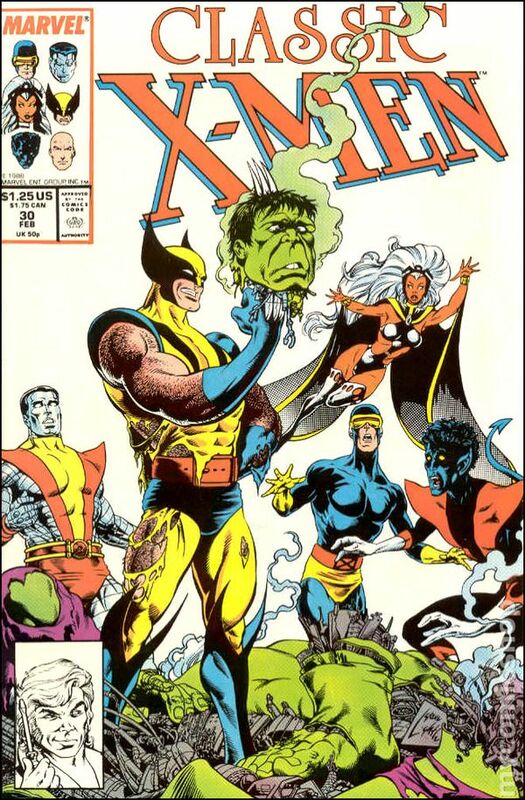 This issue reprints Uncanny X-Men 132. "And Hellfire is Their Name!" Script by Chris Claremont, pencils by John Byrne, inks by Terry Austin. New Dazzler back-up story: "Strangers on a Lift." Script by Ann Nocenti, art by Kyle Baker. New Steve Lightle illustration and cover. Cover price $1.25. 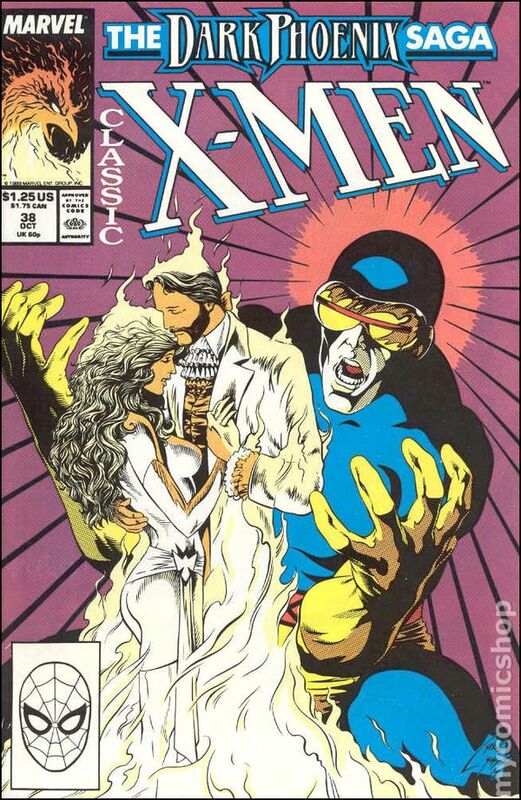 This issue reprints Uncanny X-Men 133. "Wolverine: Alone!" Script by Chris Claremont, pencils by John Byrne, inks by Terry Austin. New back-up story: "Brigg's Revenge." Script by Ann Nocenti, pencils by Jim Lee, inks by Joe Rubinstein. New Steve Lightle illustration and cover. Cover price $1.25. 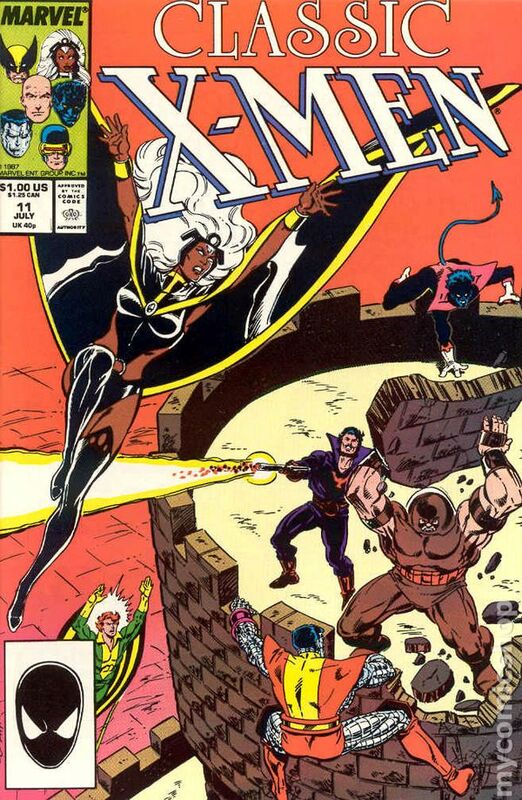 This issue reprints Uncanny X-Men 134. "Too Late, the Heroes!" Script by Chris Claremont, pencils by John Byrne, inks by Terry Austin. New Nightcrawler back-up story: "Fundamental Imbalance." Script by Tom Orzechowski, pencils by Jim Fern, inks by Joe Rubinstein. New Steve Lightle illustration and cover. Cover price $1.25. 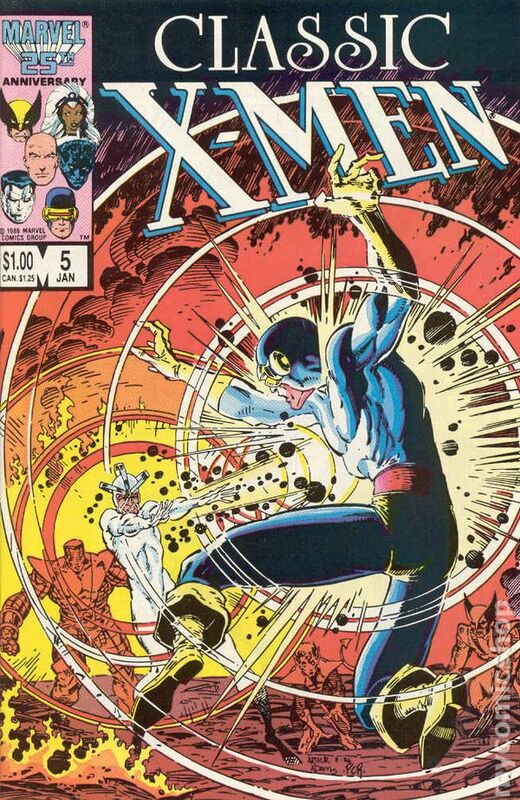 This issue reprints Uncanny X-Men 135. 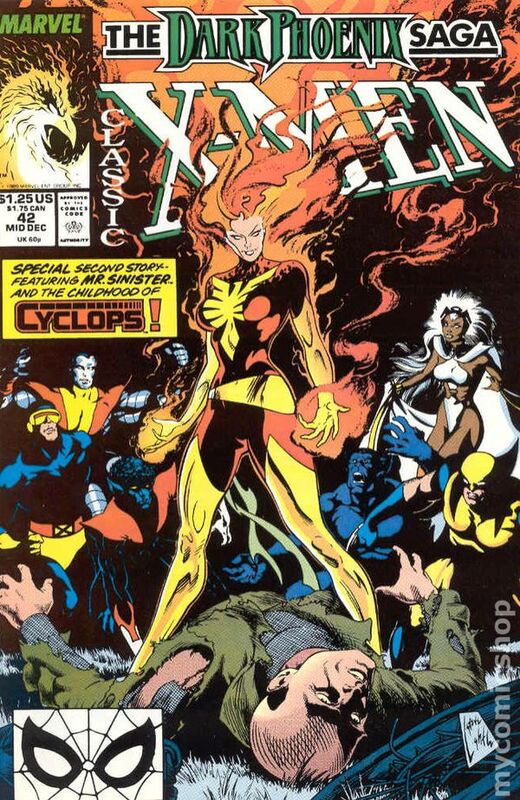 "Dark Phoenix." Script by Chris Claremont, pencils by John Byrne, inks by Terry Austin. New back-up story: "Little Boy, Lost!" Script by Claremont, pencils by Mike Collins, inks by Joe Rubinstein. New Steve Lightle illustration and cover. Cover price $1.25. 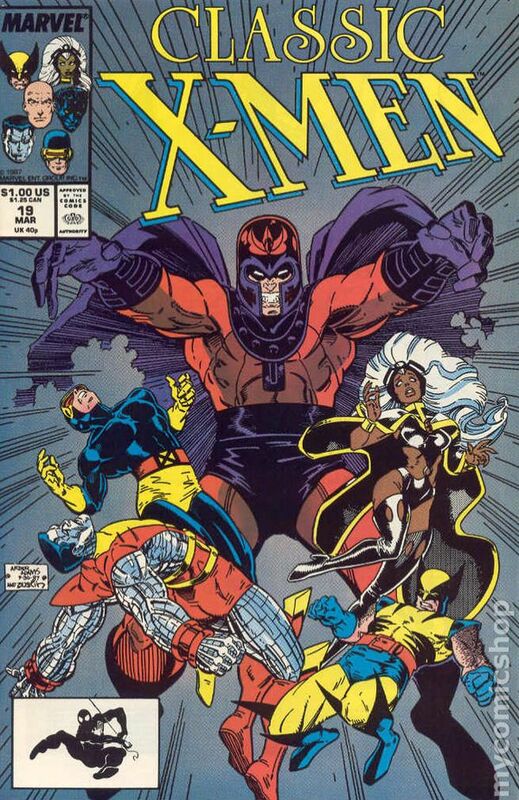 This issue reprints Uncanny X-Men 136. "Child of Light and Darkness!" Script by Chris Claremont, pencils by John Byrne, inks by Terry Austin. New back-up story: "When Dreams are Dust." Script by Claremont, pencils by Mike Collins, inks by Joe Rubinstein. New Steve Lightle illustration and cover. Cover price $1.25. Giant-size issue. 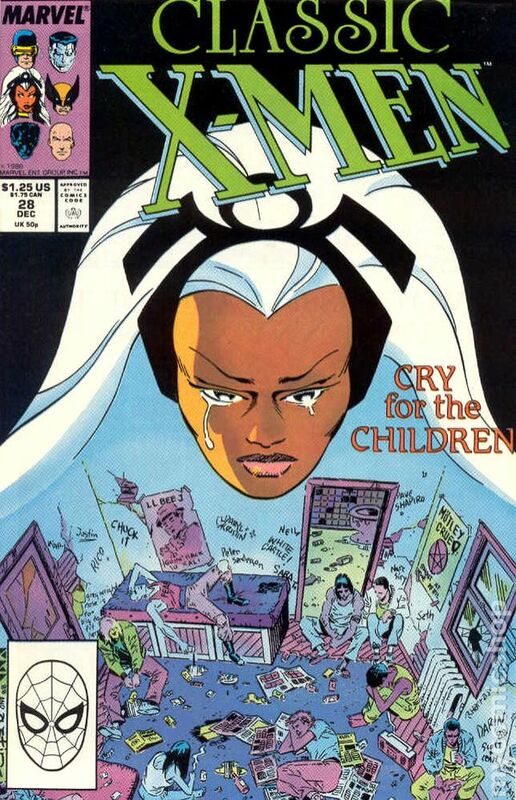 This issue reprints Uncanny X-Men 137. "The Fate of the Phoenix!" Script by Chris Claremont, pencils by John Byrne, inks by Terry Austin. New Phoenix back-up story: "Flights of Angels." Script by Claremont, pencils by Mike Collins, inks by Joe Rubinstein. New Steve Lightle illustration. New Byrne cover. Cover price $1.75. 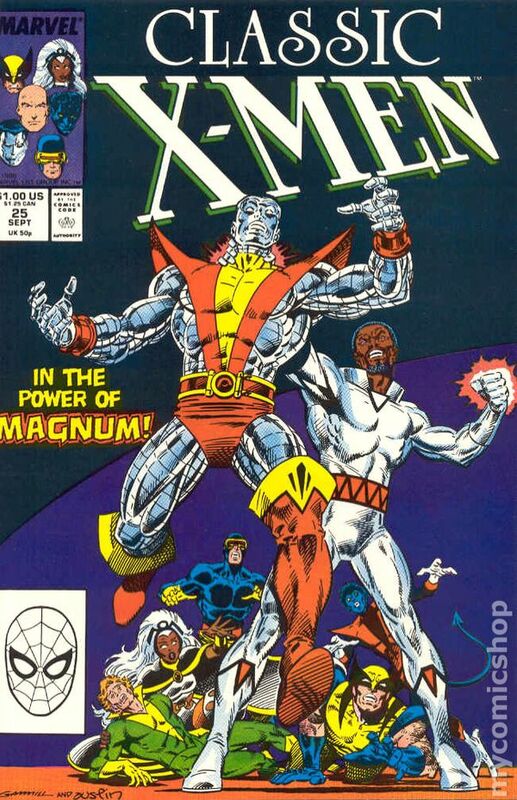 This issue reprints Uncanny X-Men 138. "Elegy." 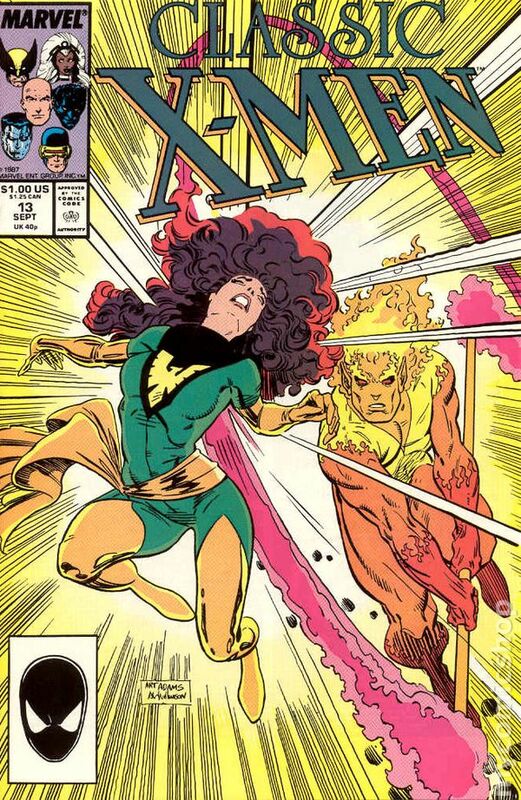 Script by Chris Claremont, pencils by John Byrne, inks by Terry Austin. New Rogue/Mystique back-up story: "Her First and Last." Script by Ann Nocenti, pencils by Kieron Dwyer, inks by Hilary Barta. New Steve Lightle illustration and cover. Cover price $1.25. Cover art by Steve Lightle. 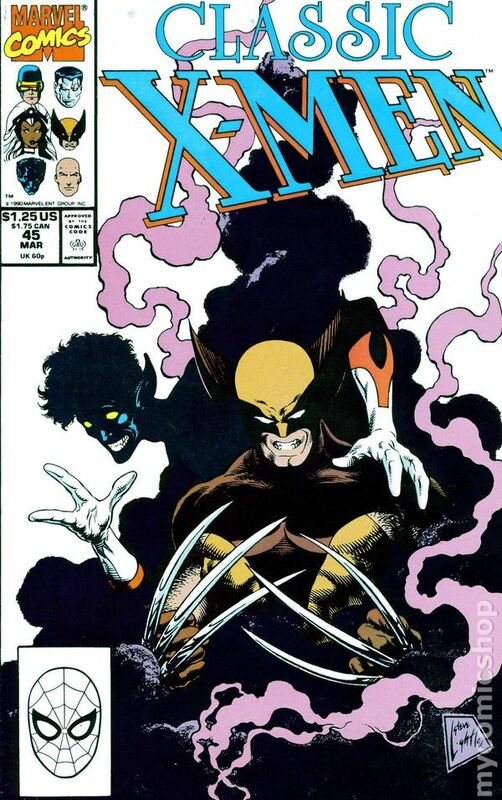 Something Wicked This Way Comes, script by Chris Claremont and John Byrne (co-plotter), pencils by John Byrne, inks by Terry Austin; The X-Men begin to train together with their new line-up; Kitty tries to adjust to life as an X-Man; Wolvie and Nightcrawler head to Canada to help Alpha Flight track down Wendigo; reprinted from Uncanny X-Men 139. 36 pgs. $1.25. Cover price $1.25. Cover art by Steve Lightle. 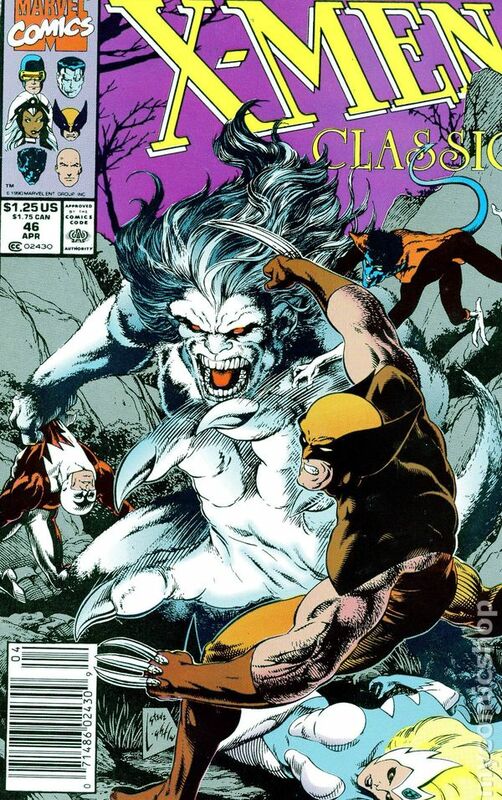 Rage!, script by Chris Claremont and John Byrne (co-plotter), pencils by John Byrne, inks by Terry Austin; Wolvie and Nightcrawler help Alpha Flight battle Wendigo; Shaman transforms the beast back to human form; The Canadian government disbands Alpha Flight; reprinted from Uncanny X-Men 140. 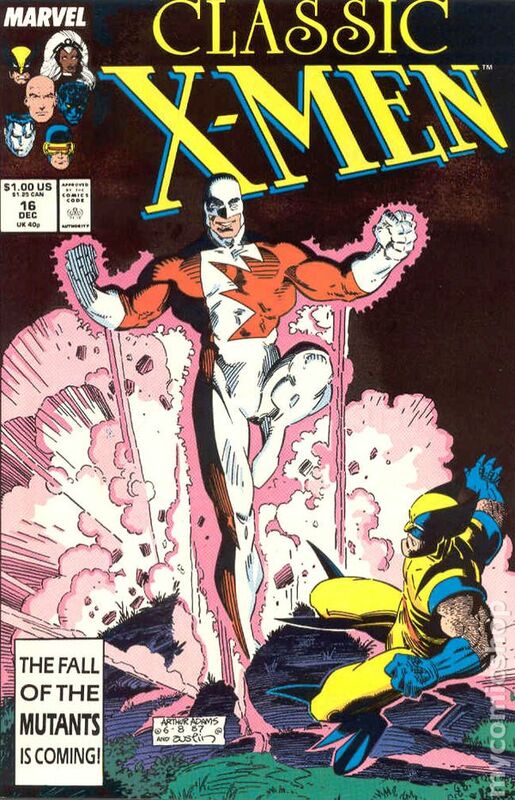 Reprinted cover to 140, pencils by John Byrne, inks by Terry Austin. 36 pgs. $1.25. Cover price $1.25. 1st Printing. Cover art by Steve Lightle. 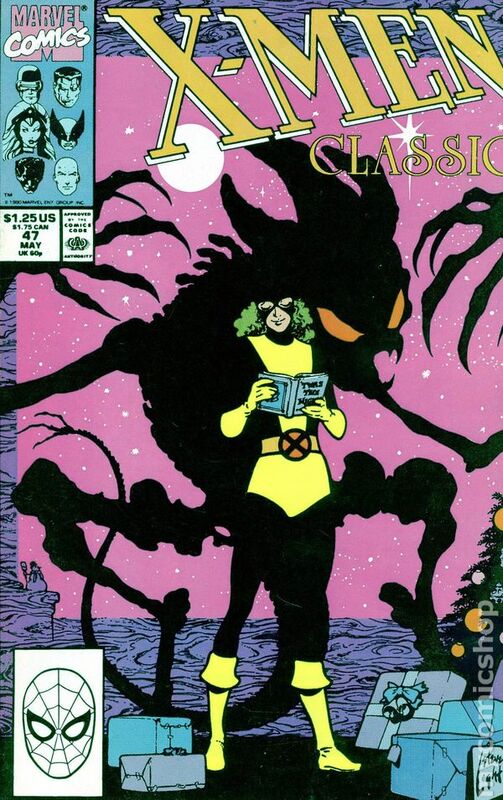 Demon, script by Chris Claremont and John Byrne (co-plotter), pencils by John Byrne, inks by Terry Austin; Kitty is left home alone on Christmas Eve and tangles with a nasty demon; reprinted from Uncanny X-Men 143. Cover price $1.25. Cover art by Steve Lightle. 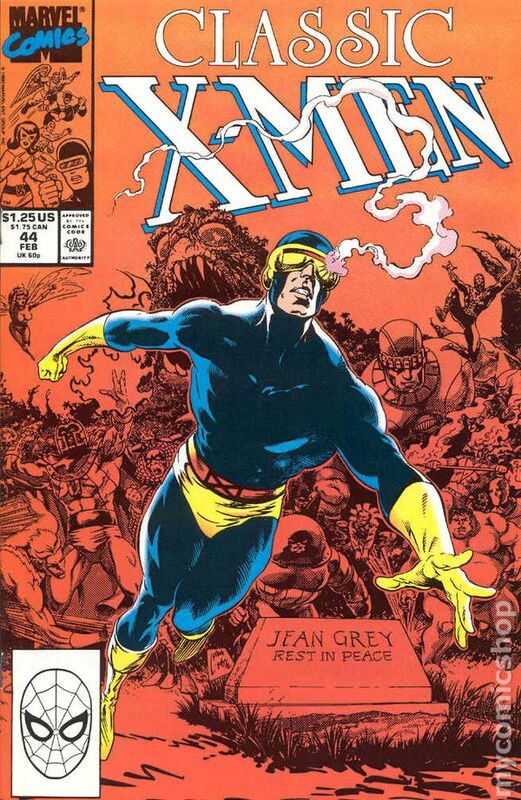 Even In Death, script by Chris Claremont, pencils by Brent Anderson, inks by Joe Rubinstein; D'Spayre pushes Lee's father to suicide and mucks with Cyclops' mind; reprinted from Uncanny X-Men 144. Reprinted cover to 144, pencils by Brent Anderson, inks by Joe Rubinstein. 36 pgs. $1.25. Cover price $1.25. Cover art by Steve Lightle. 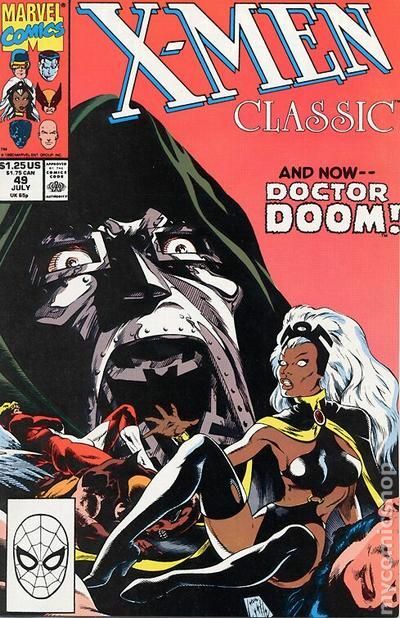 Kidnapped, script by Chris Claremont, pencils by Dave Cockrum, inks by Joe Rubinstein; Arcade returns to plague the X-Men but this time he is not alone; Marvel's Merry Mutants must match wits with the most dangerous man in the Marvel Universe - Doctor Doom! 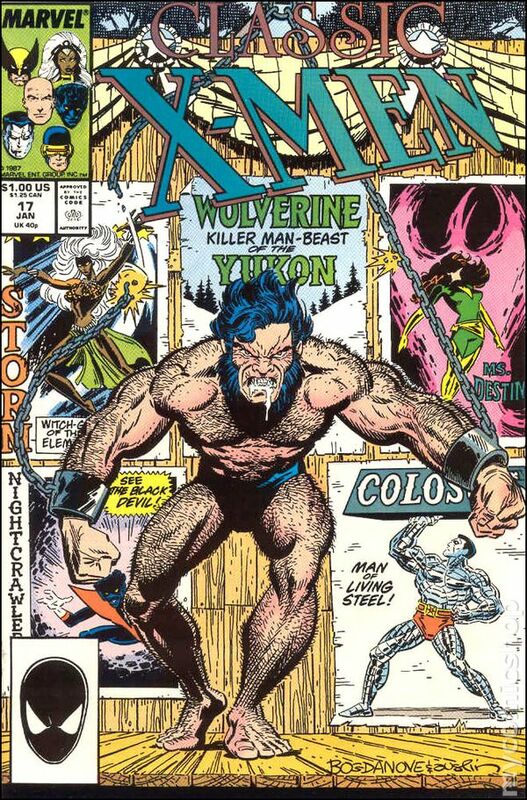 ; plus, Cyclops finds himself marooned on a desert island in the middle of nowhere; reprinted from Uncanny X-Men 145. Cover price $1.25. Cover art by Steve Lightle. 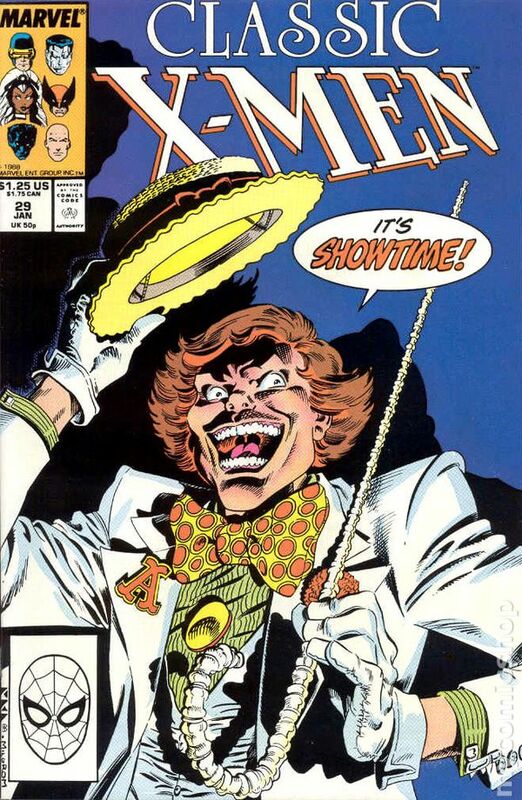 Murderworld, script by Chris Claremont, pencils by Dave Cockrum, inks by Joe Rubinstein; Can the X-Men escape the diabolical death traps created by sadistic madman Arcade; Even if they can they still have to face the power of Doctor Doom! 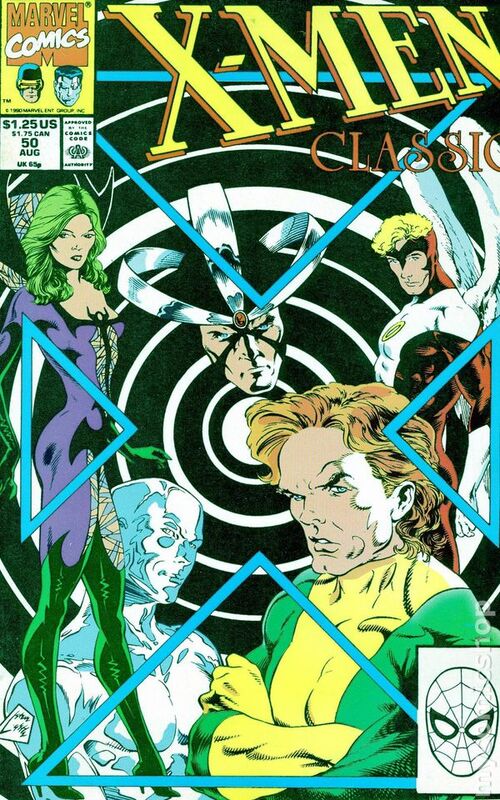 ; Meanwhile, Banshee, Havok, Polaris, and Iceman face death around every corner in Arcade's nefarious Murderworld; reprinted from Uncanny X-Men 146. Reprinted cover to 146, pencils by Dave Cockrum, inks by Joe Rubinstein. 36 pgs. $1.25. Cover price $1.25.